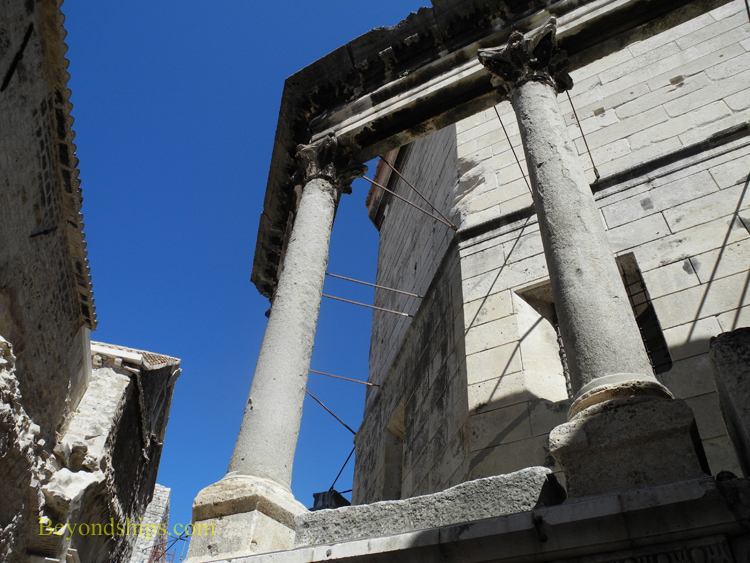 The Roman Emperor Diocletian's decision to construct a palace in Split is what put this town on the map. Prior to the Palace's construction, there had only been insignificant Greek and later Roman settlements along this stretch of the Adriatic Coast. In the following centuries, a city grew up around the Palace that is now the second largest city in Croatia. 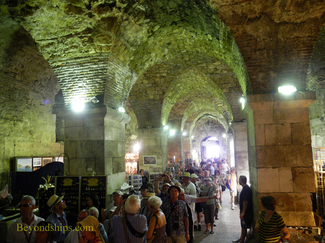 Today, Diocletian's Palace is a UNESCO World Heritage Site and the city's must-see attraction. 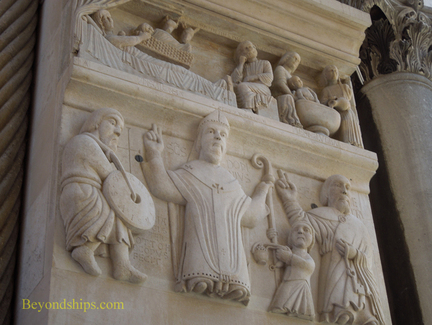 Diocletian was from the Roman province of Dalmatia. He rose from humble beginnings to become a senior military commander. When the Emperor Carus and his son Numerian died, the army proclaimed Diocletian emperor. Despite his humble birth, Diocletian was not a man of the people and ruled as an autocrat. He demanded deference from his subjects. However, he is credited with bringing a period of stability to the empire and was the first Roman emperor to voluntarily abdicate. The place he chose for his retirement in 305 A.D. is a pretty peninsula that juts out into the Adriatic. Locals say that it has 2,700 sunny hours a year and a mild climate. Palm trees grow along the shore. In keeping with Diocletian's grand self-image, the palace that he constructed is a huge complex (9.5 acres) built with white limestone and fine quality marble, much of it quarried in nearby Brac. 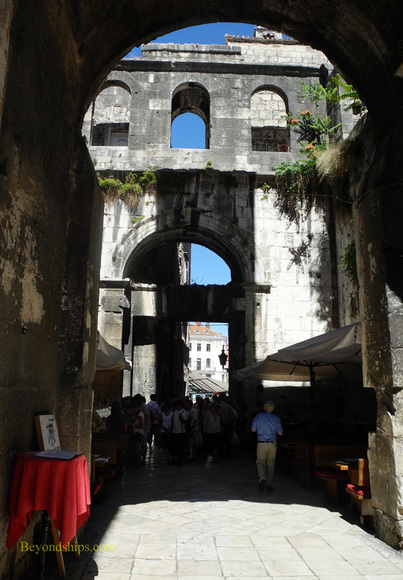 It was not a single building but rather more of a fortified city with buildings, streets, and squares. It has been estimated that some 9,000 people lived there. Following the fall of the Roman Empire, the Palace was essentially abandoned until the 7th century. Then people living nearby took refuge in the walled palace to escape from various invaders. Over time, they began to convert the area to their own use. As a result, there are ancient and medieval buildings next to each other within the walls of the Palace. The cellars beneath the Palace are now a shopping area. Above: The bell tower of the Cathedral of St. Dominus. Below: Columns outside Diocletian's octagonal mauseleum. The layout of the complex is an irregular rectangle. On each side of the rectangle is a monumental gate - - the Bronze Gate, the Iron Gate, the Silver Gate and the Golden Gate. Bisecting the complex into northern and southern sections is a street that connects the Silver Gate on the east with the Iron Gate on the western side of the Palace. The Emperor's apartments were in the southern section of the palace. The southern wall of the palace faces the sea and so visitors coming from the cruise ships anchored in the bay, usually enter through the Bronze Gate on the south side. It is just a short walk from the pier where the tenders arrive. Lying between the pier and the gate is a portion of the Riva, Split's seaside promenade with its outdoor cafes and shops. It is not a grand entrance. Visitors are routed through the cellars that lay beneath the imperial apartments. For centuries, these archaded vaults were used as a dump refuse and were not excavated until 1956. Today, they house numerous small stands that sell local crafts and jewelry. You come out of the cellars into the central square of the Palace called the Peristyle. It was here that the Emperor appeared before his followers so it had to be impressive. Six towering Corinthian columns and the elaborate Protiron entrance to the imperial quarters remain to show the grandeur that was Rome. 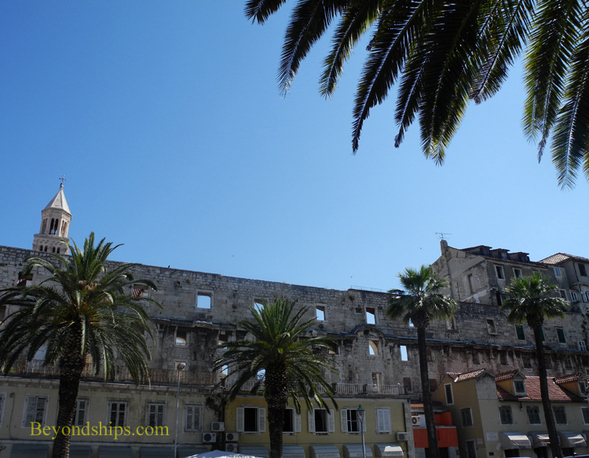 On the eastern side of the square is an ancient octagonal building that was Diocletian's mausoleum. 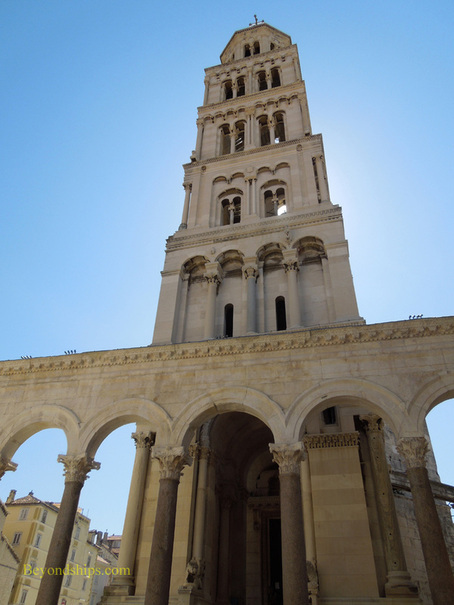 Ironically, considering that Diocletian brutally persecuted the early Christians, the building was subsequently converted into the Roman Catholic Cathedral of St. Dominus (St. Duje). In 1100 A.D. a tall Romanesque-style bell tower was added. Visitors can climb to the top for a panoramic view of the city. 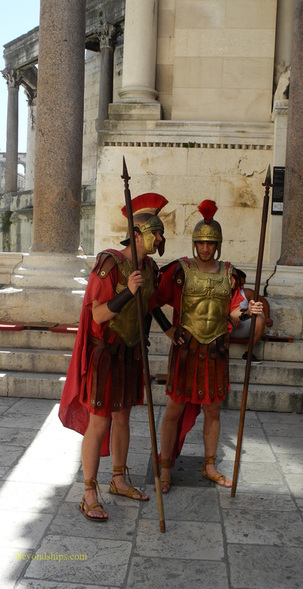 Left: Re-enactors in Roman military garb in the Peristyle.